LENGTH: Varanus indicus ranges from 75 to 120 cm in length. The head is long and narrow, with the neck longer than the head. The tail is almost two times the length of the body and strongly compressed. COLORATION: dark colorations with various small, yellow spots. The iris is dark brown with a golden ring surrounding it, and the palpebrals that surround the eye are sulphur yellow while the remaining surfaces of the eyelids are white. Also, the mouth is sometimes outlined with red and this may attract prey or frighten predators. Komodo dragons show a similar coloration. The red substance is actually blood mixed with saliva. The Mangrove Monitor has four strong, well developed legs with five, sharp, clawed toes. TEXTURE: The face is smooth and glossy, with large scales. The body and tail are covered with small, oval, keeled scales. The teeth are serrated along their anterior and posterior edges, with the dentary teeth directed slightly laterally and the maxillary teeth directed vertically. COOL FACTS: A special characteristic of this monitor is that it possesses the ability to greatly increase the size of the mouth by spreading the hyoid apparatus and dropping the lower jaw in order to eat large prey. Another special characteristic of this monitor is that they have no taste buds on their tongue, but they may have taste buds on the roof of their mouth. Although the tongue has no taste buds, it is highly specialized for chemosensory function and is frequently protruded. HABITAT: Varanus indicus occurs in the Pacific from Japan to southern Australia and on many of the islands of the Pacific. Man-aided dispersal from the East Indies to some small pacific islands was facilitated by Polynesians in order to provide a meat supply. It is not known whether all these island locations were natural or man-aided dispersal. The monitors were also introduced to Japan from the Japanese in the Marshall Islands before World War II. The habitat of V. indicus consists of damp river banks and in coastal forests. BEHAVIOR: The Mangrove Monitor can be characterized as being an “opportunistic predator” as far as feeding behavior. A study done in 1993 showed that V. indicus in the Southern Mariana Islands shifted major prey classes reflecting changes in the available prey base. The following regular prey of V. indicus have been declining: A land snail, Achatina fulica , has been greatly reduced due to the introduction of the predaceous flatworm, Platydemus manokwari, populations of slugs have been greatly reduced because of the introduction of the Cane Toad, Bufo marinus, and the shrew populations on Guam are low because of the introduction of the Brown Tree Snake. When V. indicus have been observed in captivity, males tend to be more aggressive than females, and if males feel threatened, they don’t bite, but rather defecate on the perceived threat. No courtship behavior has been observed. In one observation, after mounting the female, the male used his chin to rub the dorsum of the female’s head and forequarters. It was also observed that while mounted and oriented head to head, the male and female slowly rotated in a clock-wise direction through 360 degrees with the male remaining superior. They are extremely shy animals. DIET: The diet of V. indicus consists of small mammals, insects, crabs, bird eggs, birds, and other lizards. A study done in the Northern Mariana Islands and the Territory of Guam between the years of 1989 and 1991 showed the diet of V. indicus, in non-urban settings, consisted of 45% arthropods, 13.6% terrestrial crabs, 27.2% scincid and gekkonid lizards and their eggs, 4.5% of Ramphotyphlops braminus, and rats made of the rest of the diet, at 9.1%. In urban situations, additional food in their diet included domesticated chicken eggs, squid (a common fishing bait), and aluminum butter wrappers. REPRODUCTION / GROWTH: The clutch size of female V. indicus is about 2-12 eggs, and is smaller than would be expected of a medium sized monitor lizard because female V. indicus are very small. A female observed in Guam laid 22 eggs over a period of three years in clutches of 1-4 eggs. A captive female laid 25 eggs in five clutches over 26 months, with an average of 88 days between the last four clutches and 4-6 eggs in each clutch. The varied clutch sizes indicates that the monitors tend to reproduce continuously when food is abundant, producing large numbers of relatively small clutches. The eggs are about 3.5 – 5 cm in length, are oblong and white, and hatch in about seven to eight months. No care are given to the young by the parents when they hatch. Guam is the only place where a nesting site has been seen, and it was found in guano deposits of a cave-dwelling bird, Aerodromus vanikorensis. The site contained only egg shards. A characteristic of courting exhibited by males involves showing both physical and behavioral control over the female. Males also fight for females. A study done in 1998 looked at the reproductive ecology of V. indicus on Guam. Adult lizards acquire energy stores in the form of fat bodies to meet energy demands during reproduction. In females, stored fat is mostly used for egg production, but in males, the use of fat is not well understood but it could be used for a variety of activities, including reproductive behavior, such as searching for females, courting, mating, and territorial defense, rather than just for spermatogenesis. The results of this study showed that ovarian mass is greater during the dry season for females, the minimum body size at sexual maturity is greater in males than females, and that males have testicular sperm year-round. Fat body mass in males did not differ between seasons, but female fat body mass was greater during the dry season than during the wet season. Reproduction of V. indicus on Guam seems to occur during the dry season (January to April). The reproduction occurring during the dry season can be explained by looking at egg incubation periods and food availability for juveniles. When the young hatch during the wet season, insect abundance is greater, meaning more food for the young. CONSERVATION STATUS: There is no entry on the Red List 2000 for V. indicus . The major populations of V. indicus include Australia, Guam, Indonesia, Japan, the Marshall Islands, Micronesia (Federated States of), Northern Mariana Islands, Palau, Papua New Guinea, and the Solomon Islands. In 1994, there was a decline of V. indicus on Guam and the Mariana Islands that could have been due to the effects of urbanization. Also, farmers on these islands see the monitors as pests and try to trap, shoot and poison them because they have witnessed the monitors attacking their domesticated fowl. There is an ethnic group on Guam that eat the monitors as a traditional food, so a business exists to sell the monitors to them. The introduction of the Brown Tree Snake, Boiga irregularis, and the poisonous Cane Toad, Bufo marinus , are also known to affect the monitor population on these islands. 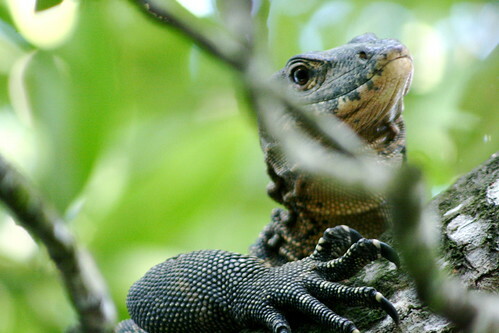 Lastly, the mangrove monitor has a beautiful skin and as a result is hunted in many places for its leather. There were CITES export quotas in 1997 and 1998 in Indonesia.